In today’s modern classroom, passive students are a thing of the past. Education is immersive and two-way interactions are a vital part of the learning environment here at Penrhos. To truly be successful in the 21st Century, we need our students to be able to adapt to different situations and apply their knowledge and skills in life. The role that is played by the teacher in supporting the development of knowledge and skills is both dynamic and rewarding. The teacher’s role is fluid and can change based on the students’ cognitive development, students’ learning styles, subject area and the teacher’s preference. Here are four common roles that the teacher plays in purposefully designing relevant and engaging learning opportunities to support students to be future ready. 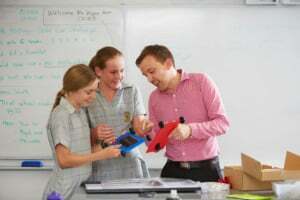 As subject experts, teachers help students to organise and connect their skills and thinking with subject knowledge. They often teach by demonstration, modelling and encouraging critical thinking. They also share their passion for the subject area through the examples they use and the questions they pose to develop curiosity and a sense of wonder about learning. To be able to do this competently, the teacher needs to be committed to lifelong learning. They need to constantly develop themselves and role model achieving their personal best to set the standard for their students. Teachers should be aware of changes in their subject area and be consistently looking to advance their knowledge and skills. At Penrhos we are committed to supporting teachers with time and access to both internal and external professional development to foster continual improvement. Gone are the days that students as passive recipients of knowledge, where being a good student means listening and being quiet unless answering the teacher’s question. Rather our teachers use their knowledge of each student and warm relationships to link to student interest and draw upon intrinsic motivation. Our teachers aim to put the student at the centre of all we do, involving them in the decision making about learning and supporting peer collaboration, thus personalising the learning process. They ensure students are actively involved in learning and differentiate to ensure all students are supported and challenged in all classes. The teacher works to facilitate the transfer of knowledge to the real world through a variety of experiences that foster 21st Century Skills. Our teachers are well versed in not only the curriculum, but also its assessment. Thus, they have a detailed understanding of the standards within their subject area and how to provide feedback to help students grow and achieve their learning goals. ‘Assessment for Learning’ provides formative feedback to help students understand what success looks like at various levels, so they may make progress along their learning journey. This approach fosters the development of a growth mind set where students are focussed on working toward achieving their personal best, whatever that may be. The role of mentor relies on strong relationships, it is a collaborative and encouraging style of teaching that helps learners apply knowledge to achieve their goals. With this approach, teachers verbalise their thinking to share experiences and values to develop understanding and give context to learning processes. The role of mentor involves providing praise for effort and perseverance, highlighting metacognitive feedback wherever possible and orchestrate instructional techniques to support students to overcome life’s hurdles on their learning journey.